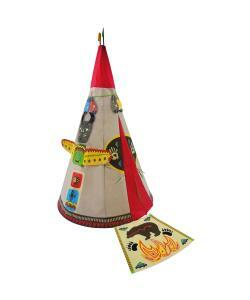 A fabulous heavy duty nylon childrens teepee play tent, perfect for indoor or outdoor use. 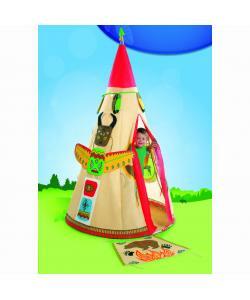 Children will have endless adventures playing with this wonderful tepee... 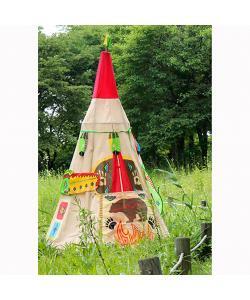 The teepee also includes 3 Red Indian dress up accessories; Totem pole wings, Red Indian sorcerer mask which stick to the side of the teepee and Red Indian feather garland. Other features include an entrance mat, flap over window, target hole and entrance door tie backs. If your little children need a place to rest after a hard day hunting and gathering, or just need shelter from the harsh plain's (garden) sun, then where better than their very own wigwam play tent?! Every little adventurer needs a place of their own, and this place is just perfect! 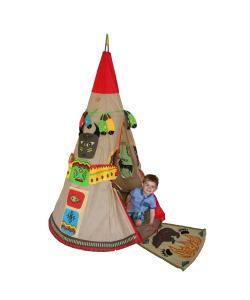 The teepee frame is made from high quality snap together plastic pieces and high quality heavy duty nylon. It is suitable for ages 3 and up and stands 190cm tall with a 120cm wide base so is perfect for those with even the largest moccasins on the block! Includes 3 piece Red Indian dress up set; Totem pole wings, Red Indian sorcerer mask which stick to the side of the teepee and Red Indian feather garland. Tie back the door opening to make an open play space or close the doors to make a secret hiding place. Great for outdoor naps, offers great protection from the wind and sun. Absolutely ideal for hiding in yourself when you want five minutes peace away from the rest of the family. Don't forget the family size bar of chocolate and/or bottle of wine! Absolutely ideal to put in your kid's bedroom or the playroom for an instant room makeover. Most importantly, it is an instant room tidy. Just open the tent door and kick everything in there that has been lying around on the floor for weeks. Instant result!